Potato Solanum tuberosum - Tubers roots and leaves. Early blight on potato. 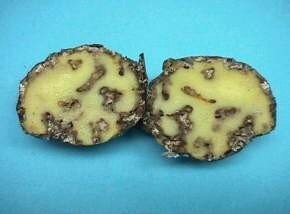 On potato tubers, early blight results in surface lesions that appear a little darker than adjacent healthy skin. Lesions are usually slightly sunken, circular or irregular, and vary in size up to 1.9 cm in diameter. There is usually a well defined and sometimes slightly raised margin between healthy and diseased tissue. Internally, the tissue shows a brown to black corky, dry rot, usually not more than 6mm. Deep cracks may form in older lesions. (c) Chad Behrendt. Reproduced from University of Minnesota Extension. Early blight on potato leaf. Note concentric rings on spots. Late blight on potato tubers. (c) Courtesy EcoPort (http://www.ecoport.org): William E. Fry. Reproduced from the Crop Protection Compendium, 2004 Edition (c) CAB International, Wallingford. Bacterial wilt symptoms on potato plants. The first visible symptom on foliage is a wilting of the leaves at the ends of the branches during the heat of the day with recovery at night. As the disease develops, a streaky brown discolouration of the stem may be observed on stems 2.5 cm or more above the soil line, and the leaves develop a bronze tint. No yellowing is observed with bacterial wilt ? it?s a sudden death. Secondary infection to potato tubers in storage due to damage by the potato tuber moth. Potato tubers damaged by the potato tuber moth. Potato originated in the highlands of South America, where it has been consumed for more than 8000 years. Spanish explorers brought the plant to Europe in the late 16th century as a botanical curiosity. By the 19th century it had spread throughout the continent, providing cheap and abundant food. Potato arrived in Africa around the turn of the 20th century. British farmers introduced it to East Africa in the 1880s. Potato has grown in importance - both as a staple food and as a source of farmer incomes in medium to high altitudes in Kenya over 30 years. Nearly all of Kenya's potatoes are consumed locally, at an average rate of almost 25 kg per capita a year. Potato is relished by the rural people who grow them and also by higher-income urban dwellers. In Kenya it is considered a high quality and prestigious food item. *Percent Daily Values (DV) are based on a 2000 calorie diet. Your daily values may be higher or lower, depending on your calorie needs. Potato requires well-distributed rainfall of 500 to 750 mm in a growing period of 3 to 4.5 months. Most commercial cultivars of potato tuberise (form tubers) best in cool climates with night temperatures below 20degC. Optimum day temperatures are within the range of 20 to 25degC. Short day lengths (12 to 13 hours) lead to early maturity. In the short day length conditions of the tropics and subtropics, maximum yields can usually be obtained in cool highland areas and in cooler seasons. Cultivation is concentrated in highland areas from 1200 to 3000 m above sea level.In regions with a critical dry season, planting early in the rainy season is best. If the rainy season is long and excessive, time of planting is usually towards the end of the rainy season. Potato is tolerant to a rather wide variety of soils, except heavy, waterlogged clays. Good drainage is of great importance. Impermeable layers in the soil limit rooting depth and the amount of available water, and so greatly reduce yields. Deep soils with good water retention and aeration give best growth and yields. The most suitable soil pH is between 4.8 and 6. 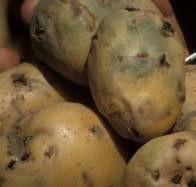 At higher pH, tubers are liable to suffer from scab disease. Potato is normally propagated vegetatively by small (40 to 100 g) tubers, called 'seed tubers' or 'seed potatoes'. It can also be propagated by pieces of tuber ('seed pieces') or by true seed. The seed rate (tubers) ranges from 1.5 to 4.0 t/ha. The first problem facing growers in developing countries is obtaining supplies of healthy planting material of a suitable cultivar at an acceptable price. Some countries undertake traditional propagation of the seed tubers on sites in the highlands with suitable cool but frost-free climates and where the population of insect vectors of diseases can be kept at an adequately low level. Recently, the use of true potato seed for propagation has aroused great interest. True seed does not transmit most of the potato diseases, is very light and is easy to transport. Promising methods to grow potatoes from true seed include raising seedlings in a nursery and transplanting them to the field. In regions with a critical dry season, planting early in the rainy season is best. If the rainy season is long and excessive, time of planting is usually towards the end of the rainy season. 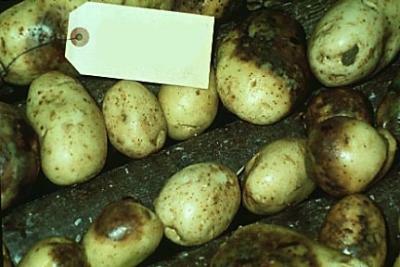 Potato subjected to heavy rainfall during growth or harvest is prone to diseases. Tubers planted to produce potatoes for consumption should generally be planted in rows 75-100 cm apart with a spacing of 30 to 40 cm within the row (25 to 44,000 plants per ha). The closer spacing should be used in fertile soils and good rainfall areas to avoid the production of very large tubers. Seed potatoes are planted at a spacing of 15 to 20 cm within the row (about 80,000 plants per ha). Potatoes are planted at a depth of 5 to 15 cm (measured from the top of the tuber). Planting depth is greater under warm, dry conditions than under cool, wet conditions. Shallow plantings should be avoided, because the lower nodes of the stem must remain covered to encourage tuberisation (tuber initiation) and to avoid greening of tubers and tuber moth damage. Earthing up or hilling is carried out to control weeds and to avoid greening of the tubers. Potatoes are normally planted by hand in developing countries, but mechanical planters are available. Plough-under or incorporate available organic manures in the soil before planting to enhance the water-holding capacity and texture of the soil as well as to provide enough nutrients for a healthy crop. A high yielding potato crop under conventional farming removes 95 to 140 kg N (nitrogen)/ha, 35 kg P (phosphorus)/ha, 125 to 170 kg K (potassium)/ha and has relatively high needs for Mg (magnesium) and Mn (manganese). Organic farmers will need to identify organic sources for similar amounts of nutrients. Potatoes respond well to large amounts of compost or well-rotted animal manures. Fertiliser recommendations based on soil analysis offer the very best chance of getting the right amount of fertiliser without over or under fertilising. Ask for assistance from the local agriculturist office for soil sampling and soil analysis procedures. In Kenya certified healthy seed potatoes are available from KALRO Tigoni, ADC Molo and Agrico East Africa among others. (Source: Ministry of Agriculture & Rural Development and Japan International Development Agency (2000)). Adequate control of weeds is required to ensure high yields. In the tropics, manual weeding is generally practised in small-scale production, but herbicides are sometimes used in large-scale production. Potato responds well to high soil fertility. Manure or compost is needed if the land has been continuously cropped. Well-decomposed animal manure or compost is recommended. Ridging soon after emergence helps control weeds, prevents greening of developing tubers and prevents spores of late blight fungus from reaching the tubers. Wide ridges or mounds are required for intercropping. Potatoes can be intercropped with a wide range of annual crops such as sweet potato, maize or even pyrethrum. Potatoes planted in rotation or intercropped with barley, maize, peas, or wheat prevents soil exhaustion. In this case, intercrops are planted at the bottom or at the edge of the furrows and the potatoes on the ridge. However in order to get full benefit from a potato crop such as high yields, weed suppression and ease of management, without building up high levels of soil-borne diseases: it is recommended to grow potatoes in a separate field and rotate the crop with others. Interplanting with a short season legume such as beans can increase total crop yield and help prevent spread of diseases. Avoid planting potatoes in the same field for several consecutive seasons. Proper crop rotation enhances soil fertility, increases soil organic matter, conserves soil moisture and helps maintain soil structure. In addition, it avoids build-up of soil-borne pathogens affecting potato, and reduces the level of soil infestation once the soil has been contaminated. Rotations should not include crops that are common hosts for diseases and pests of potatoes (e.g. tomato, eggplant, pepper). Rice, maize and legumes are recommended for crop rotation practices. Planting brassicas such as broccoli, cabbage and mustard plants before the potato crop helps reducing incidence of bacterial wilt and nematodes. Control volunteer potatoes and weeds in the rotation crop. Time of harvesting of potato varies with cultivar, cultural practices, climate and price. Tubers harvested while still immature tend to have low dry matter content and to suffer more skin damage, resulting in easier infection by fungal and bacterial pathogens. However, seed potatoes are often harvested early, to avoid virus infection that may occur during the latter part of the growing season. Late blight attack may also be a reason for early harvesting. The harvesting operation involves destroying the aboveground parts (haulm), lifting and collecting the tubers. A general practice to avoid excess mechanical damage to tubers at harvesting is to cut the tops 10 to 14 days before lifting the potatoes to give them time to develop matured and hardened skins. The haulm is destroyed either by manual or mechanical cutting. In small-scale farming in the tropics, lifting is done manually using simple implements such as sticks, hoes and spades. Mechanical harvesting is carried out only in large-scale farming areas using various types of potato diggers, for example, ploughs, spinners or elevator diggers. Semi-automatic diggers lift the tubers from the soil for hand-picking or collection. Harvesting should not be done during or immediately after rain. In 2014, the average yield of storage potato tubers throughout the world was about 20 tonnes per hectare (t/ha). Average yields (t/ha) for different continents in 2014 were: Asia (18.8), Africa (13.6), North America (43.7), South America (16.5), Europe (22.1) and Oceania (41.3) (FAOSTAT, 2014). In many tropical and subtropical regions potential yields are much higher than actual yields due to constraints (environmental, seasonal, propagation, crop protection, economic and social) that prevent the full expression of this potential, but individual farmers in Kenya have reported yields up to 35 t/ha. Harvesting or any other handling to which potato tubers are subjected may cause damage ranging from external injury to internal bruising. After harvesting it is advantageous to allow the tubers to dry in heaps for about 1 to 2 weeks at 10 to 20degC (or in cold store) under high humidity before further handling. During this time the skin hardens, wounds heal, adhering soil dries and disease symptoms become more visible, which facilitates the removal of the infected tubers. Grading should not be started before the curing and hardening have taken place, otherwise further damage occurs. If the hardening has taken place in the soil before harvesting, grading for sale can be done immediately to avoid greening and sprouting. Before the tubers go into storage, rotten and infected tubers, which may become sources of post-harvest disease infection, should be removed. Potato tubers are usually delivered into stores in bags, baskets or crates. To facilitate handling, containers should not be too large; if they are large they should not be filled completely. Storage of ware potatoes for the market is associated with undesirable quality changes (mainly sprouting, high sugar content, and weight loss due to evaporation and respiration). For short-term storage (1-2 weeks) in the tropics, ware potatoes may be stored at ambient temperatures in the dark, in well-ventilated buildings. Small-scale farmers can keep potatoes in on-farm storage using inexpensive, well-ventilated constructions. After cold storage, seed potatoes should be pre-sprouted in diffuse light to ensure optimal development of sprouts prior to planting. By storing seed tubers in diffused light at ambient temperatures, excessive sprouting is avoided and seed potatoes can be kept in good physiological condition for a long period of time. If potatoes are stored in bulk without cold storage in the tropics for more than a couple of weeks, they completely loose appeal and will start rotting. Potatoes are very susceptible to root-knot nematodes. Root-knot nematodes prefer warm temperatures and are likely to become established in potato crops grown in relatively warm areas. Generally, they are not a major problem in cool climate potato production areas, but can become a problem when potatoes are grown intensively or rotated with other susceptible crops. Infested potato plants may show varying degrees of stunting, yellowing of leaves and a tendency to wilt under moisture stress. Roots have swellings or galls. Affected tubers have blisters or swellings. On potato tubers, galls may or may not be produced on the tuber surface, depending on cultivars. When galls are produced, they appear as small, raised lumps above giving the skin a rough appearance. Galls may be grouped in a single area or scattered near the tuber eyes. Infestations are difficult to detect in freshly harvested potato tubers. Symptoms may develop when tubers are stored, particularly when taken to warmer climates where nematode numbers can rapidly increase. Symptoms are most severe when crops are grown on sandy soils and warm climates above 25 degC. Nematode attack reduces the quality, size and number of tubers. Root-knot nematode infested potatoes can become more susceptible to bacterial wilt, and symptoms are more severe when plants are also infected with fungal pathogens such as Verticillium and Rhizoctonia. 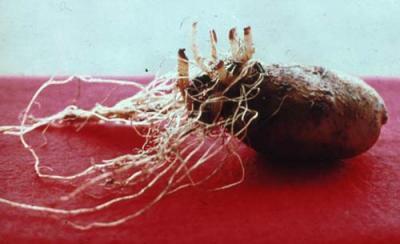 Root-knot nematodes are mainly spread in potato tubers and in infested soil. Egg masses may be transported into clean fields via soil adhering to farm machinery. Spread within fields occurs during cultivation and in water, during irrigation or natural drainage. Practise proper crop rotation (e.g. potato - brassicas - cereals). Use mixed cropping or grow marigolds (Tagetes spp.) or sunn hemp (Crotalaria juncea). Maintain high levels of organic matter in the soil (manure and compost). Bio-fumigation (incorporating fresh plant mass, especially mustard or radish plants, in large amounts into the soil before planting potatoes) helps against root knot nematodes. Decomposing plant parts release compounds, which kill nematodes. Two weeks after incorporating plant material into the soil a new crop can be planted (phytotoxic effects are exhibited if the crop is planted before 2 weeks). Okra roots damaged by root-knot nematodes. Note gall or root-knots (left) and healthy roots (right). Many aphid species attack potatoes. The most important are the green peach aphid (Myzus persicae) the potato aphids (Macrosiphum euphorbiae, Aulacorthum solani) and the cotton aphid (Aphis gossypii). Aphids are mainly found on young shoots on the underside of leaves. Feeding by aphids causes irregular curling of young potato leaflets and hinders growth of the leaflet. Potato aphids can also attack potato sprouts in stores. Direct damage caused by aphids sucking sap from the plant is usually of little importance. Most damage is caused by honeydew production on foliage and virus transmission. Aphids are important pests as vectors of potato viruses such as the Potato Leaf Roll Virus, a serious disease affecting potatoes. Seed potatoes are particularly susceptible to this virus and even low aphid populations can be very damaging. Conserve natural enemies. They are important in natural control of aphids. (Link to natural enemies datasheet). Control aphids in potato planted for seed production. Site seed production areas in locations with low temperature, abundant rainfall and high wind velocity. Aphid populations are generally low under these conditions. 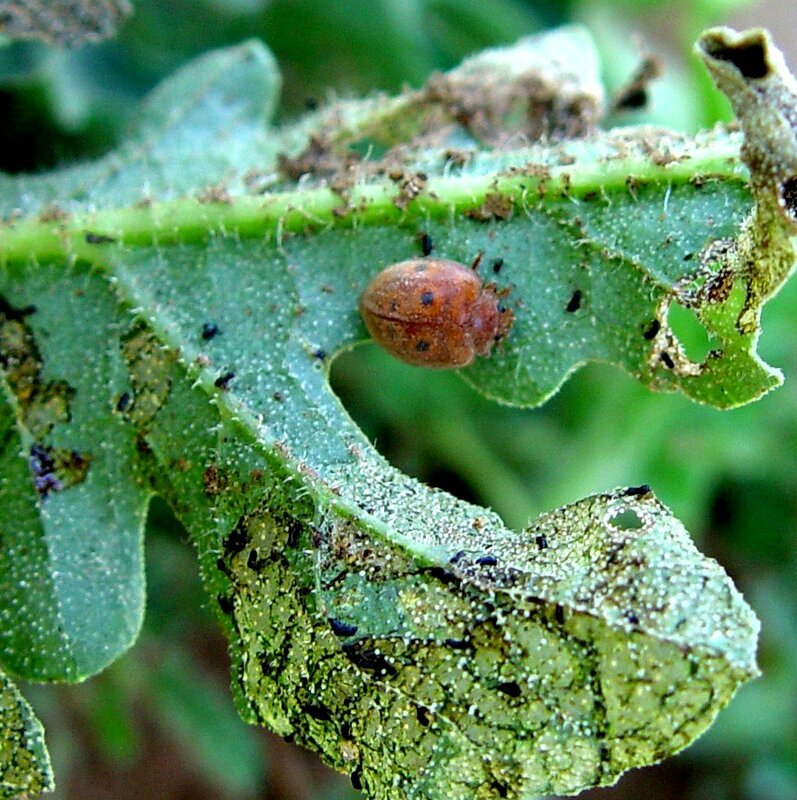 Within a potato growing area, locate seed potato fields upwind from commercial potato fields and alternative host crops to reduce dissemination of viruses through aphids carrying viruses. Keep seed production areas separated from commercial potato production. Check the field regularly. Monitoring of aphid build-up is important. Protect young plants from aphid attack. Virus spread early in the season is more serious than later on, as young plants are generally more susceptible. Moreover, plants that are infected early become more efficient sources for further virus spread than plants infected later in the season. Harvest seed potatoes no later than 8 to 10 days after a critical aphid build-up or increased virus infection rates are noted. 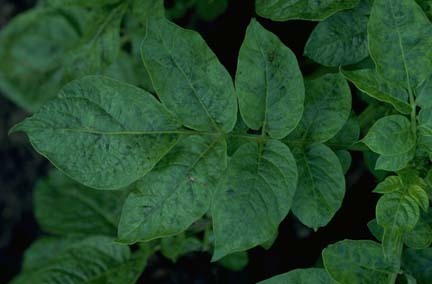 This may help to avoid infection since the virus requires time to infect the tubers after a virus-carrying aphid has fed on potato foliage. Remove yellow flowering weeds and any other host plants within and around the field. Aphids are attracted to yellow colour. Protect potato tubers during storage by preventing access of aphids. Potato aphids readily colonise tuber sprouts. Seed potatoes are very susceptible to infection at this stage. 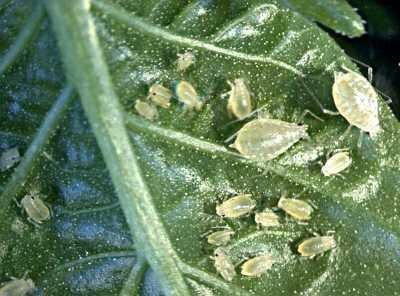 Neem products are useful for reducing aphid populations on potatoes. In Sudan, 2 applications of seed extracts at a rate of 1kg seed kernels/40l water at a 14 days interval reduced aphid (A. gossypii) population to 60% compared to the control (Zebitz, 1995). Extracts of the weed Artemisia vulgaris have also shown toxicity to potato aphids (Metspalu and Hiiesar, 1994). Aphids (Myzus persicae). Adult wingless females are oval-bodied, 1-2 mm in body length, of very variable colour. 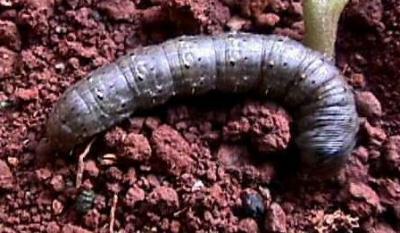 Cutworms are caterpillars of some moths. The caterpillars live in the soil and eat into tubers boring a wide shallow hole. They are also serious pests of newly sprouted potato plants, and can leave empty patches in a potato field. Protect plants by wrapping them with collars. A simple collar can be made from cardboard tubes from paper towels or toilet paper (cut to size). This practice is time consuming, but it is effective and practicable in small fields. If necessary spray neem extracts. Neem leaf extracts and neem seed extracts (1 kg/40 l water) have been effective against cutworms attacking potatoes reducing damage significantly in Sudan. Cutworm (Agrotis sp.) Early instars are about 7-12 mm long. Fully grown caterpillars are 35-50 mm long. Several species of Epilachna beetles feed on the leaf tissue in between the veins leaving a network of veins intact. The adult beetles are oval, about 6 mm in length and reddish brown to brownish yellow in colour with black spots on their backs. They look very similar to the beneficial ladybird beetles (predators), but the body of this pest ladybird beetle is covered with short, light coloured hairs, which give them a non-glossy or matt appearance. They lay eggs in clusters (20 to 50 eggs), usually on the underside of the leaves and placed vertically. The larvae (grubs) are pale yellow and easily recognisable by the strong branched spines covering their body. Generally, these beetles are minor pests of potatoes, but occasionally the infestation is so severe that control measures are needed. Handpick and destroy adults and larvae of Epilachna beetles. This is feasible in small plots. Spray neem extracts. Simple neem-based pesticides have been reported to control Epilachna beetles on several crops. Thus, sprays with an aqueous neem seed extract (10g/l) at 10 days intervals showed repellent effect on these beetles in India. In Togo, feeding by Epilachna beetles in squash and cucumber could be reduced significantly by weekly applications of aqueous neem kernel extracts at concentrations of 25, 50 and 100 g/l and neem oil applied with an ultra-low-volume (ULV) sprayer at 10 and 20 l/ha (Ostermann and Dreyer, 1995). Millipedes are not insects, but are related to them. They have many legs (30 to 400) with a hard-shelled, round segmented body. They are brown to blackish brown in colour. They move slowly and curl up when disturbed. Millipedes lay eggs singly or in clusters of 20 to 100 in the soil. They live in moist soil and congregate around the plants in soil that is rich in organic content. They dry out easily and die. Thus, they seek wet places, such as compost piles, leaves and other plant debris, to hide under during the day. They tunnel into potato tubers. Clear hiding places. Remove volunteer plants, crop residues, decaying vegetation, dead leaves, grass, compost piles, excess mulch or other similar debris. Litter under trees, abandoned termite hills, and neglected home nurseries can also harbour large populations of millipedes. Trap millipedes. They like hiding during daytime. They can be attracted by placing flat objects (such as pieces of plywood) on the ground where they hide under and can be collected subsequently. Potato tubers damaged by millipedes. G. rostochiensis is indigenous in Peru and is now widely distributed in potato-growing regions. The major hosts of G. rostochiensis are crops in Solanaceae family, potato, tomato, eggplant and solanaceous weeds. 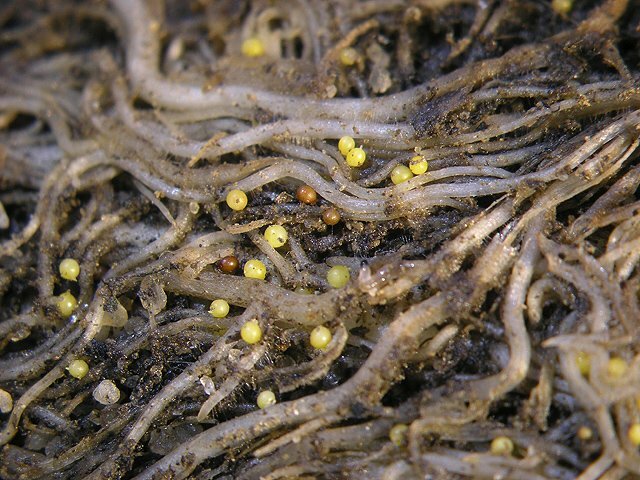 PCN are microscopic worms that attack plant roots. 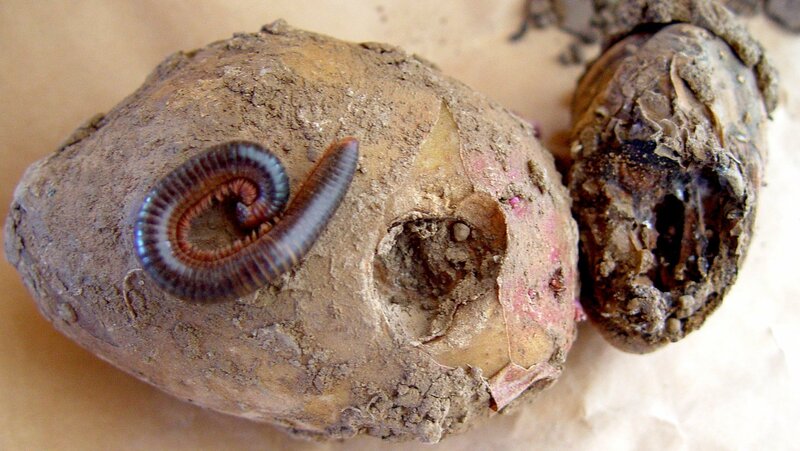 The eggs hatch in the soil, juvenile nematodes move to, penetrate and feed on the host roots. After mating, fertilized eggs develop inside females that are attached to roots. When the females die, their skin hardens and becomes a protective brown cover (cyst) around the eggs. Each cyst contains hundreds of eggs, and can remain viable for many years in the absence of host plants. One generation normally occurs during one growing season. At flowering or later stages of the host plant, mature females and cysts can be seen by the naked eye as tiny round objects (about 0.5 mm, the size of a pinhead) on the root surface. Potato cyst nematode is spread by wind, run off water, farm equipment, animals, clothing/foot ware. Symptoms of attack include patches of poor growth, severe stunting, yellowing, wilting and reduced size of potato tubers. Avoid planting potatoes for up to 7 years in infested fields. Trap cropping - planting a crop of potato to stimulate the eggs to hatch and then removing the plant before the nematodes can complete their life cycle. This moth is the most serious pest of potatoes in the region. It occurs in Africa wherever potatoes are grown, and it also attacks tobacco, eggplants and tomatoes. The moth is small (measuring about one mm at rest and with 12 to 16 mm wingspan), brownish grey in colour with narrow fringed wings. The moths are active mainly at dusk, but occasionally they can be seen flying within potato plants. Female moths lay eggs singly or in small batches on sheltered places of the foliage (leaf and stems) and near the eye buds on exposed tubers through cracks in the soil or in the store. The caterpillars are up to 12 mm long and whitish to pale greenish in colour. They feed as leafminers between the upper and the lower epidermis and bore into the petiole, or a young shoot or main leaf vein and later into the tuber. When eggs are laid on tubers, caterpillars begin feeding on the tubers immediately upon hatching. They pupate in a silken cocoon covered with soil particles and debris among dead potato leaves, soil litter, eyes of tubers, and storage walls and floors. Caterpillars burrowing in the tubers cause major damage by making long irregular black tunnels filled with excreta, where disease-causing microorganisms grow. These tunnels provide an entry point for various plant pathogens and make the potatoes unfit for human consumption. 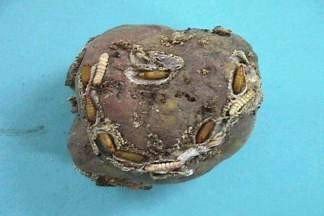 The pest is transferred with the harvested tubers to the potato store, where it can reproduce and infest other tubers. This may lead to total destruction of the stored crop. Use healthy, clean seed, since infested seed tubers are the main cause of re-infestation in the field. Avoid planting in rough soil. Plant as deeply as possible (10 cm deep) and ridge at least 3 times during the growing season. Experiments in Sudan showed that increasing the sowing depth from 2.5 cm practised by farmers to 7.6 cm, significantly reduced damage by the cutworms and the potato tuber moth and resulted in an increase of 3.7 t/ha in marketable yield (Siddig, 1987). Ensure compact hilling. This is very important to prevent moths reaching the tubers to lay eggs. It also makes it difficult for caterpillars to reach the tubers. In addition, emerging moths from infested tubers will not be able to emerge through deep soil. Provide enough water to prevent soil cracks. Mulch the plants with rice straw and/or with leaves. Mulching with neem leaves during the last 4 weeks before harvest significantly reduced insect damage in Sudan. (Ali, 1993). Intercrop potatoes with hot pepper, onions or peas. Harvest the crop immediately as it matures, as tubers left in fields for longer periods are highly infested. At harvesting, ensure that the tubers are not exposed to moths before they are properly protected in the store. All harvested tubers have to be bagged and removed before late afternoon every day. Destroy all infested potatoes immediately and remove all plant residues from the field. Caterpillars pupate in the tubers and dry stems left in the field. Destroy all volunteer potato plants before planting new potato crops. Use alternative pesticides to protect potatoes in store. 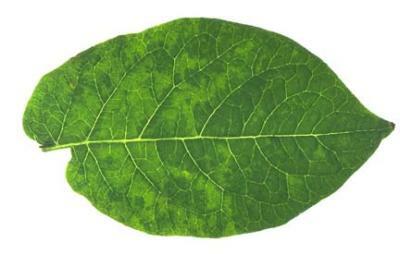 Neem can be applied to reduce damage by the potato tuber moth. For instance, in India a four months protection was achieved when harvested potatoes and the covering material were sprayed with five and 10% enriched neem seed extract (Saxena, 1995). In Sudan spraying neem seed and leaf extracts (1 kg/40 l water) and then placing tubers in jute sacks reduced post harvest losses by the potato tuber moth compared with traditional methods such as leaving the tuber unprotected or covering them with banana leaves only (Siddig, 1987). 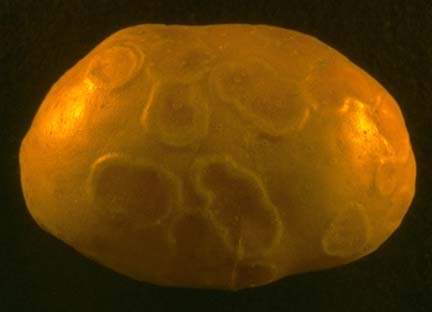 A neem seed extract was also effective for control of the potato tuber moth on stored potatoes in Egypt (Salem, 1991) . Storage loss after 6 months in potatoes treated with 100ppm neem oil was 25% (compared to 10% with the insecticide carbaryl). Adults from larvae treated with neem oil were deformed. Work in Yemen confirmed the beneficial effect of neem; neem oil and sunflower oil halted the development of caterpillars of the potato tuber moth in storage. However, caution is needed since the oil seemed to interfere with potato respiration, leaving the potatoes very soft with dark tissue (Kroschel, 1995). A Bt (Bacillus thuringiensis) preparation in powder form mixed with fine sand (1:25) dusted was very effective in controlling this pest in the store in Yemen and Kenya (Kroschel, 1995). Tuber infestation was also reduced by bedding the potatoes in the leaves of the Peruvian pepper tree (Schinus molle), also known as mpilipili in Swahili, and Eucalyptus sp. (Kroschel, 1995). Storing potatoes in layers with branches of lantana is recommended by Kenya Institute of Organic Farming (KIOF) in areas where this pest is present lantana is reported to repel tuber moths. Application of plenty of wood ash or diatomite earth may also prevent rapid build up of tuber moth. Potato tuber moth adult (Phthorimaea operculella) is about 12-16mm long. Potato tubers damaged by the potato tuber moth (Phthorimaea operculella). Parasitic wasp (Copidosoma khoeleri), a natural enemy of potato tuber moth (Phthorimaea operculella). Pupae of the potato tuber moth (Phthorimaea operculella) on potato tuber. Bacterial wilt can be very destructive at the lower altitude, warmer extreme of the potato's range in Kenya. This disease causes rapid wilting and death of the entire plant without any yellowing or spotting of leaves. All branches wilt at about the same time. The pathogen is transmitted through tuber seed into the soil. Also infested soil can be important source of disease inoculum (infection). Use clean certified disease-free seed. Remove wilted plants to reduce spread of the disease from plant to plant. Do not grow crops belonging to the same family as potatoes (e.g. tomatoes, peppers or eggplant) in succession in the same land. Rotation is not effective against bacterial wilt because the pathogen can survive for several years in the soil and also can infect a wide range of crops and weeds. However, the disease incidence can be reduced if crop rotation with non-susceptible crops (e.g. cereals) is combined with the other above-mentioned control components. Bacterial wilt symptoms on potato plants. The first visible symptom on foliage is a wilting of the leaves at the ends of the branches during the heat of the day with recovery at night. As the disease develops, a streaky brown discoloration of the stem may be observed on stems 2.5 cm or more above the soil line, and the leaves develop a bronze tint. 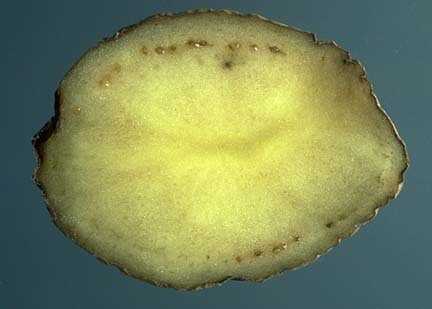 The bacteria enters through wounds and cause extensive rotting of potatoes due to degradation of tuber cell walls, often reducing tubers to a smelly pulp. They may also be carried over on tubers, and shoots (stems) emerging from infected tubers. These are blackened and commonly referred as blackleg, and the affected stems subsequently die. Use resistant varieties where available. This constitutes the best management strategy. Use healthy seed tubers and avoid injury to the tubers. Store and transport tubers in dry, well ventilated conditions. This disease is favoured by cool, cloudy, wet conditions. 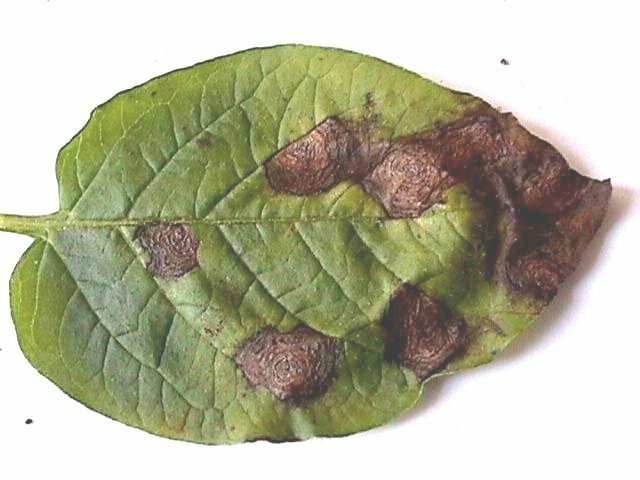 Symptoms of late blight are irregular, greenish-black, water soaked patches, which appear on the leaves. The spots soon turn brown and many of the affected leaves wither, yet frequently remain attached to the stem. Plant resistant varieties where available. In Kenya, varieties "Tigoni", "Kenya Baraka", "Roslin Eburu", "Annet" and "Asante" are claimed to have some resistance to late blight. Practise rotation with non-solanaceaous crops (do not rotate with tomatoes and eggplants). Practise good field hygiene. Pull up and discard infected plants. Keep foliage dry and avoid overhead irrigation. Plant potatoes in sunny, well-drained locations. KARI has also conducted studies to evaluate lower cost measures used by farmers to control late blight, including the application of a mixture made of stinging nettle (possibly Urtica massaica, though not indicated) and Omo (presumably the commercial brand of laundry detergent). Although this treatment was not as effective as a commercial fungicide, Ridomil, blight scores were nevertheless lower and yields higher than observed for the control. On a benefit to cost basis, the stinging nettle treatment was impressive, at over two to one (KARI 2000). This treatment is apparently not a common practice in Kenya, at least not yet, but an example of using stinging nettle (Urticaria dioica) as a treatment against late blight in Sweden is reported in Ecology and Society. Late blight (Phytophthora infestans)on potato tubers. Infected potato tubers exhibit wet and dry rots. (c) William E. Fry. Reproduced from the Crop Protection Compendium, 2004 Edition. (c) CAB International, Wallingford. Late blight (Phytophthora infestans)on potato tubers. 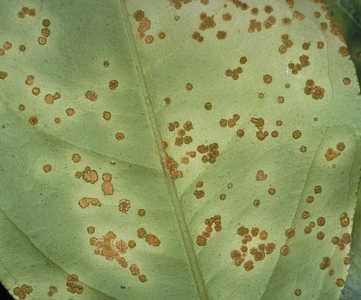 Leaf spots of early blight are circular, up to 12 mm in diameter, brown, and often show a circular pattern. 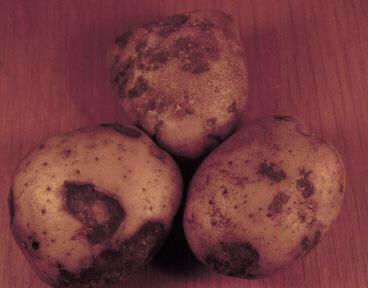 On the potato tuber early blight results in surface lesions that appear a little darker than adjacent healthy skin. Lesions are usually slightly sunken, circular or irregular, brown and vary in size up to 1-2 cm in diameter. There is usually a well defined and sometimes slightly raised margin between healthy and diseased tissue. Internally, the tissue shows a brown to black corky, dry rot, usually not more than 6 mm. Deep cracks may form in older lesions. Early blight thrives best under warm wet conditions. Practise rotation with non-solanaceaous crops. Practise good field hygiene. Remove infected leaves during the growing season and discard all badly infected potato plant debris at the end of each season. Avoid overhead irrigation and lay down a thick organic mulch to prevent soil splashing onto lower leaves. Early blight results in surface lesions that appear a little darker than adjacent healthy skin. Lesions are usually slightly sunken, circular or irregular, and vary in size up to 2 cm in diameter. There is usually a well defined and sometimes slightly raised margin between healthy and diseased tissue. Internally, the tissue shows a brown to black corky, dry rot, usually not more than 6 mm. Deep cracks may form in older lesions. 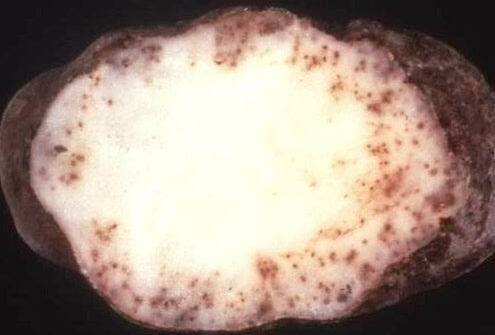 Black scurf (Rhizoctonia solani), powdery scab (Spongospora subterranea) and common scab caused by the bacterium (Streptomyces scabies). These diseases may cause similar symptoms. Black scurf and scab cause skin blemishes (russeting; rough corky tissue) on tubers. These lesions may be so numerous as to involve the entire surface of affected tubers. Such lesions spoil the appearance of the tubers and cause waste in peeling and reduction in grade. These pathogens live in the soil and survive in infected tubers. In most cases infection occurs whilst the tubers are still in the ground. In case of scab use healthy certified seed tubers. Disinfect seed tubers from infected field through heat-treatment (10 min in water at 55 degC). 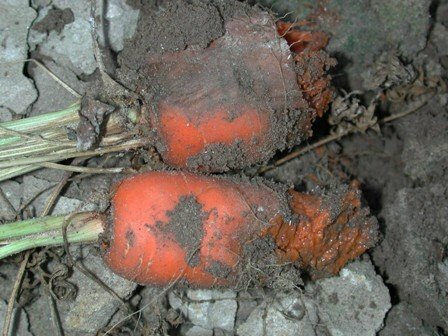 The same treatment of naturally or artificially contaminated seed tubers gave complete absence of blackleg infection in the field and decreased the amounts of powdery scab (Spongospora subterranea) and black scurf (Rhizoctonia solani) on progeny tubers. For more information on heat treatment click here. 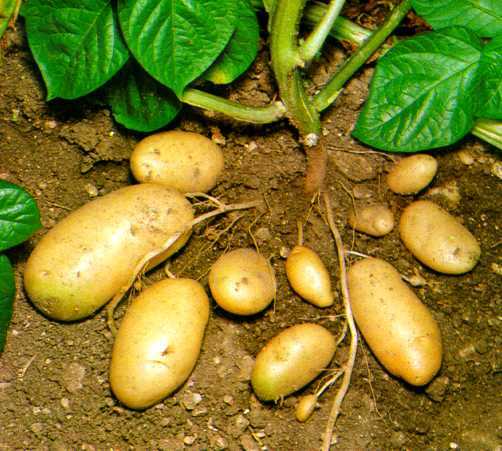 Avoid excessive liming and continuous cropping with potatoes. Maintain soil pH at about 4.8 if continuous cropping cannot be avoided. Under field conditions, there is often a composite infection with the 3 viruses (PLRV; PVX; PVY) and it becomes very difficult to distinguish the three on the basis of symptoms. These viruses are transmitted by aphids. PVX causes distinct leaf mottling and crinkling. PVY causes dwarfing of plants, with a rough, mosaic appearance to the leaves and affected plants give a poor crop of small tubers. PVY is also tuber-borne. Potatoes infected with PLRV show an upward and inward rolling of leaflet margins and plants are dwarfed. Affected leaflets become thick and dry, and the lower leaves may become completely brown. Infected plants produce tubers smaller in size and numbers. PLRV also infects other solanaceous crops and weeds (e.g. tomato, tobacco, jimson weed). Plant resistant varieties where available. In Kenya, the following potato varieties are claimed to possess some resistance to viral diseases: "Kenya Baraka", "Roslin Eburu", "Feldelslohn", "Annet" and "Dutch Robjn". Uproot infected plants to reduce the incidence of infection and spread of the disease within a field. For maximum effectiveness remove the diseased plant, the 3 plants on each side of the diseased plant in the same row, and the three closest plants in adjacent rows. This is particularly important in seed fields. Control of insect vectors may reduce virus spread. Do not overlap potato crops. It is particularly destructive for seed production. 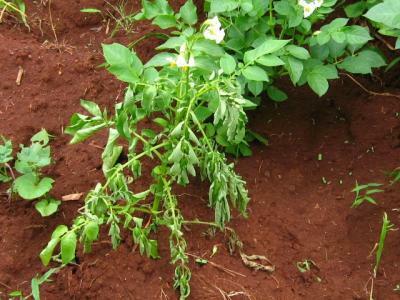 Potato plants severely infected are upright, stunted and much thinner than normal plants. Leaves of infected plants are smaller and may be grey or distorted. The affected stems are often more branched and branches are at very sharp angles to the stem. Symptoms are more obvious on tubers. 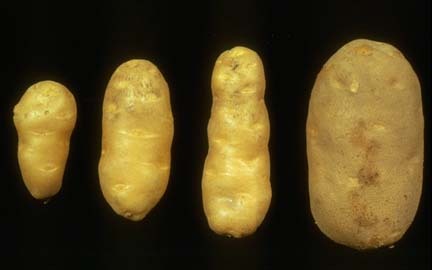 Affected tubers are small, narrow and spindle shaped (oblong). In some varieties tubers develop knobs and swellings. 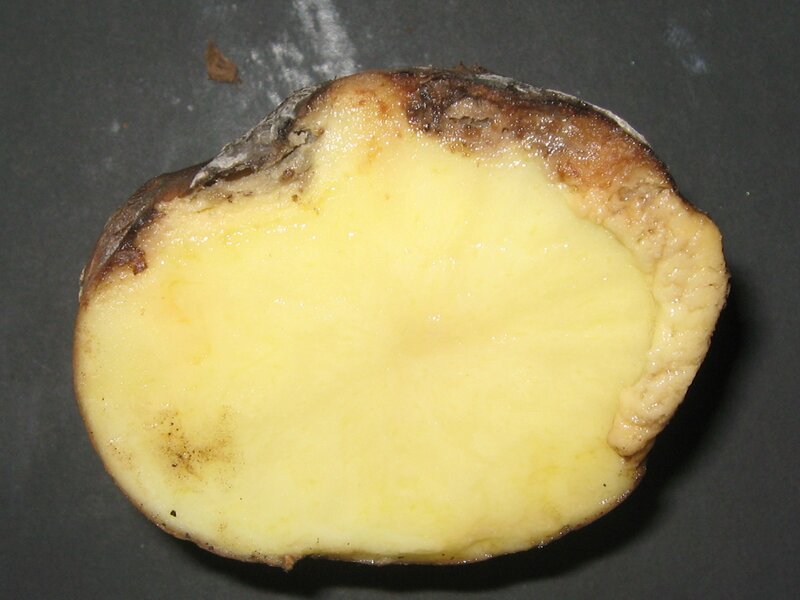 In other varieties eyes on tubers are numerous, shallow and prominent, and affected tubers are often cracked. This viroid is easily mechanically transmitted. An infection can be introduced by sowing infected seed tubers, by insects such as aphids, grasshoppers and flea beetles, and through pollen. Tomato and capsicum are additional hosts for PSTVd. Plant certified disease-free seed tubers. Plant whole seed tubers instead of cut pieces. Remove infected plants from the field. Spindle tubers with deep eyes (far right healthy). The major weeds in potato crops are annuals. Weeds can reduce yields through direct competition for light, moisture and nutrients. They may harbour pests and diseases that attack potatoes. Early season competition of weeds is very critical. When properly grown, the crop normally covers the ground and smothers any weed competition. Weeds present at harvest increase mechanical damage to the tubers, and reduce harvesting efficiency by slowing down harvesting operations and leaving tubers in the ground. 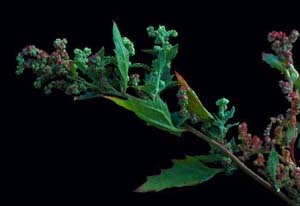 The most important weed in potatoes worldwide is pigweed or fat hen (Chenopodium album). Practise crop rotation. Rotation of 2 or 3 years is an important strategy to control perennial weeds. Weeds tend to thrive with crops of similar growth requirements as their own and may benefit from practices directed to the crop. When diverse crops are used in a rotation, weed germination and growth cycles are disrupted by variation in cultural practices associated with each crop. Control weeds early in the season. It is important to stop broadleaved weeds or annual grasses from appearing above the crop and competing strongly for nutrients and moisture when tubers are enlarging. (c) Courtesy EcoPort (http://www.ecoport.org): Photography courtesy of Western Weeds CD-ROM. Web version by R. Randall. Ali, M.A (1993). Effects of cultural practices on reducing field infestation of potato tuber moth (Phthorimaea operculella) and greening of tubers in Sudan. Journal of Agricultural Science, 121(2): 187-192; 19 ref. Berg, G. (2006). Agriculture notes. Root-knot nematode on potatoes. AG0574. ISSN 1329-8062. State of Victoria, Department of Primary Industries. Bohlen, E. (1973). Crop pests in Tanzania and their control. Federal Agency for Economic Cooperation (bfe). Verlag Paul Parey. ISBN: 3-489-64826-9. CIP Nairobi (2005). Estimates of Currently grown potato cultivars. Centipedes and millipedes. Later's Pest Info Bulletin. Godfrey,L. D., Davis, U.C., Haviland, D. R.(2003). UC Pest Management Guidelines. How to Manage Pests. Potato Aphids, green peach aphid (Myzus persicae), potato aphid (Macrosiphum euphorbiae)]. 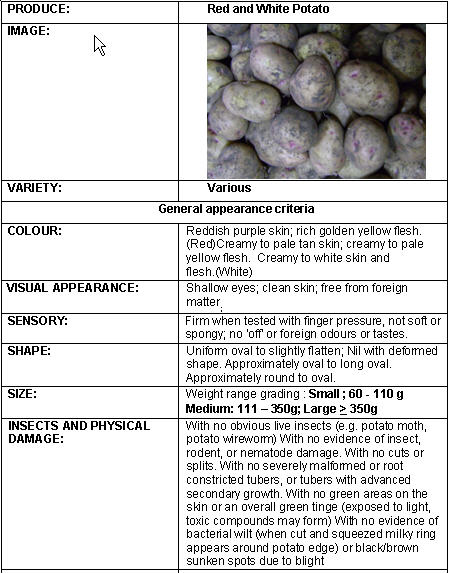 UC IPM Pest Management Guidelines: Potato. UC ANR Publication 3463. Insects. UC Cooperative Extension, Kern Co. (Reviewed 6/03, updated 6/03). Statewide IPM Program, Agriculture and Natural Resources, University of California. Kfir, R. (2003). Biological control of the potato tuber moth Phthorimaea opercullela in Africa. In: Neuenschwander, P. - Biological Control in IPM Systems in Africa. Kroschel, J. (1995). Integrated pest management in potato production in the Republic of Yemen- with special reference to the integrated biological control of the potato tuber moth (Phthorimaea operculella Zeller). Tropical Agriculture 8.GTZ. Margraf Verlag. ISBN: 3-8236-1242-5. Ministry of Agriculture and Rural Development (Kenya) & Japan International Cooperation Agency (2000). Local and Export Vegetables Growing Manual. Reprinted by Agricultural Information Resource Centre, Nairobi, Kenya. 274 pp. Ostermann, H. and Dreyer, M. (1995). Neem Products for Pest management. Vegetables and grain legumes. In: The Neem tree Azadirachta indica A. Juss. and other meliaceous plants sources of unique natural products for integrated pest management, industry and other purposes. Edited by H. Schmutterer in collaboration with K. R. S. Ascher, M. B. Isman, M. Jacobson, C. M. Ketkar, W. Kraus, H. Rembolt, and R.C. Saxena. VCH. pp. 392-403. ISBN: 3-527-30054-6. Zebitz, C. P. W. (1995). Neem Products for Pest management. Root and Tuber Crops. In "The Neem tree Azadirachta indica A. Juss. and other meliaceous plants sources of unique natural products for integrated pest management, industry and other purposes". (1995). Edited by H. Schmutterer in collaboration with K. R. S. Ascher, M. B. Isman, M. Jacobson, C. M. Ketkar, W. Kraus, H. Rembolt, and R.C. Saxena. VCH. pp. 403-407. ISBN: 3-527-30054-6.